Prestige Jindal City is located in hassle-free surrounds of Tumkur Road, Bangalore. This area is one of the emerging growth corridors of the city with prominent up-gradation of infrastructure and connectivity. This zone has emerged as an important industrial/commercial hub of Bangalore and with available land parcels, it has emanated into all-inclusive micro-market with essential social and civic conveniences. The improved connectivity through the NICE Ring Road to south Bangalore, the presence of the Bangalore International Exhibition Centre and the elevated expressway to the airport have all accelerated the expansion of this locale. 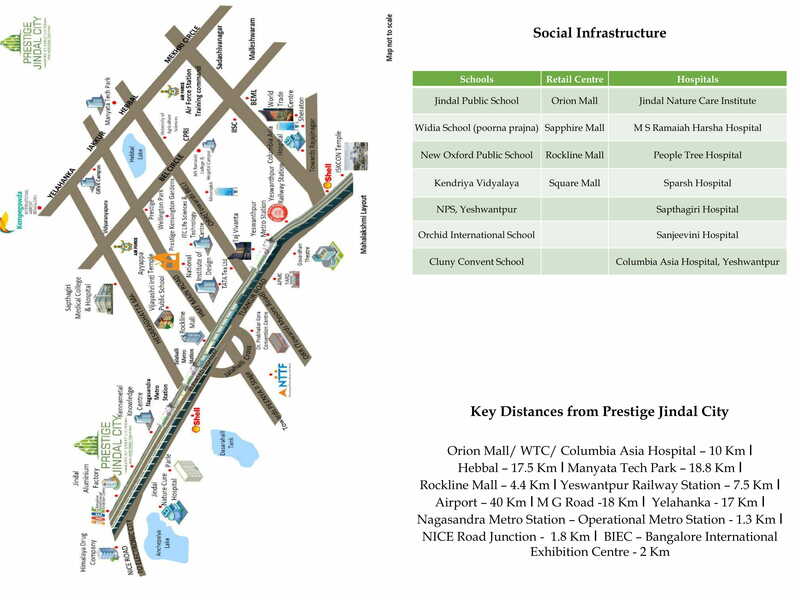 Prestige Jindal City is located on Tumkur Road which is one of the emerging growth corridors of Bangalore City. Tumkur road and its surrounding areas have endorsed major amplification in-terms of infrastructure and connectivity. This has accelerated the advancements of residential, commercial, and industrial developments. The up gradation of elevated Tumkur Highway connecting to Nelamangala, proposed Bangalore-Mumbai Industrial Corridor, easy connectivity to the international airport and the presence of Outer Ring Road have all backed the development of this zone. Tumkur Road is one of the rapidly developing areas of Bangalore City with good physical and social framework. The property rates are evidently affordable when compared to other prime zones of the city. The feasible connectivity to major locations is changing the archetypical industrial nature of this region, setting off the demand for residential properties. The demand for apartment complexes has tremendously increased paving way for many A-Grade construction companies to establish their signature projects here.